Chop activists spot 24 rail cars with roundwood. Prime Minister Volodymyr Groysman severely criticized the head of the State Fiscal Service Roman Nasirov in connection with an incident in Chop, Transcarpathian region, where activists prevented smuggling out of 24 cars with round wood. On 17 April, local activists spotted in the freight customs control area 24 cars loaded with high-quality round timber destined for Slovakia. In the documentation, the cargo was listed as firewood. In Ukraine, the export of Roundwood is prohibited by law. Grosyman demanded an internal investigation to be conducted. "The findings must be submitted to the National Anti-Corruption Bureau," prime minister said. 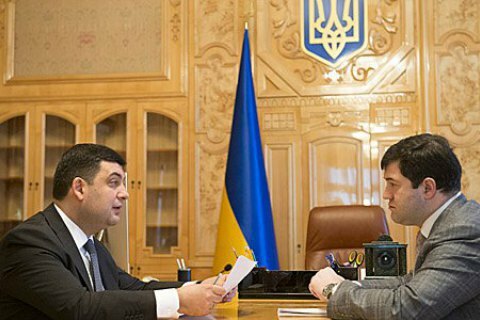 Groysman also demanded to investigate possible involvement of railroad authorities, environmentalists and foresters, and make sure that perpetrators are dismissed. Groysman also called for personnel decisions in respect of customs management. “I suspect they have established a system of smuggling, and use it. There must be toughest personnel decisions that they can be ", - he said. Nasirov assured premier that an official investigation into the incident is underway and should be completed this week. Gorshenin Institute to hold roundtable "21st century: data access instead of data exchange"